Array defined at the VolIndexs of an Box in an EBIS. 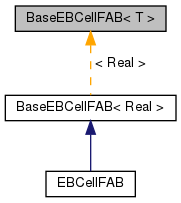 An BaseEBCellFAB is a templated holder for cell-centered data over the intersection of a box and an EbisBox. At every uncovered VolIndex in this intersection, the BaseEBCellFAB contains a specified number of data values. At singly valued cells, the data is stored internally in a BaseFab. At multiply-valued cells, the data is stored internally in an BaseIVFAB. BaseEBCellFAB provides indexing by VolIndex. This class does not provide a copy constructor or assignment operator for all the usual reasons. has to be by value because sometimes the vector does not exist. References BaseEBCellFAB< T >::define(), and BaseEBCellFAB< T >::setDefaultValues(). Constructs an 'aliased' BaseEBCellFab of the requested interval of the argument BaseEBCellFab. This BaseEBCellFab does not allocate any memory, but sets its data pointer into the memory pointed to by the argument BaseEBCellFab. It is the users responsiblity to ensure this aliased BaseEBCellFab is not used after the original BaseEBCellFab has deleted its data ptr (resize, define(..) called, or destruction, etc.). This aliased BaseEBCellFab will also generate side effects (modifying the values of data in one will modify the other's data). References MayDay::Error(), and BaseEBCellFAB< T >::m_isDefined. References Box::cellCentered(), CH_assert, CH_TIME, BaseEBCellFAB< T >::clear(), EBISBox::getEBGraph(), EBISBox::getMultiCells(), BaseEBCellFAB< T >::getRegion(), EBISBox::getRegion(), IntVectSet::isEmpty(), Box::isEmpty(), BaseEBCellFAB< T >::m_ebisBox, BaseEBCellFAB< T >::m_hasMultiCells, BaseEBCellFAB< T >::m_irrFAB, BaseEBCellFAB< T >::m_isDefined, BaseEBCellFAB< T >::m_regFAB, and BaseEBCellFAB< T >::m_region. Referenced by BaseEBCellFAB< T >::BaseEBCellFAB(). References BaseEBCellFAB< T >::m_isDefined, and BaseEBCellFAB< T >::m_regFAB. Referenced by BaseEBCellFAB< T >::define(), and BaseEBCellFAB< T >::~BaseEBCellFAB(). References BaseEBCellFAB< T >::m_irrFAB, and BaseEBCellFAB< T >::m_regFAB. References CH_assert, BaseEBCellFAB< T >::isDefined(), Box::isEmpty(), BaseEBCellFAB< T >::m_irrFAB, and BaseEBCellFAB< T >::m_regFAB. Referenced by BaseEBCellFAB< T >::assign(), BaseEBCellFAB< T >::copy(), BaseEBCellFAB< T >::fill(), BaseEBCellFAB< T >::getMultiCells(), BaseEBCellFAB< T >::getMultiValuedFAB(), BaseEBCellFAB< T >::getRegion(), BaseEBCellFAB< T >::getSingleValuedFAB(), BaseEBCellFAB< T >::nComp(), BaseEBCellFAB< T >::operator()(), and BaseEBCellFAB< T >::setVal(). References CH_assert, BaseEBCellFAB< T >::isDefined(), and BaseEBCellFAB< T >::m_regFAB. Referenced by BaseEBCellFAB< T >::operator()(). References CH_assert, BaseEBCellFAB< T >::isDefined(), and BaseEBCellFAB< T >::m_region. Referenced by BaseEBCellFAB< T >::assign(), BaseEBCellFAB< T >::box(), BaseEBCellFAB< T >::copy(), BaseEBCellFAB< T >::define(), BaseEBCellFAB< T >::fill(), BaseEBCellFAB< T >::operator()(), and BaseEBCellFAB< T >::setCoveredCellVal(). References CH_assert, BaseEBCellFAB< T >::isDefined(), and BaseEBCellFAB< T >::m_irrFAB. Arg a_isKnownMultiValued should be set to: -1 if arg a_ndin is known to be in a single-valued cell; +1 if arg a_ndin is known to be in a multi-valued cell; 0 if you're not sure (in which case the expensive IntVectSet::contains() function gets called. Note: BVS says third arg is a wart that makes this operator look less like a logical array access. References CH_assert, VolIndex::gridIndex(), EBISBox::isCovered(), BaseEBCellFAB< T >::isDefined(), EBISBox::isMultiValued(), BaseEBCellFAB< T >::m_ebisBox, BaseEBCellFAB< T >::m_irrFAB, BaseEBCellFAB< T >::m_regFAB, and BaseEBCellFAB< T >::nComp(). References CH_assert, MayDay::Error(), BaseEBCellFAB< T >::getRegion(), VolIndex::gridIndex(), EBISBox::isCovered(), BaseEBCellFAB< T >::isDefined(), EBISBox::isMultiValued(), BaseEBCellFAB< T >::m_ebisBox, BaseEBCellFAB< T >::m_hasMultiCells, BaseEBCellFAB< T >::m_irrFAB, BaseEBCellFAB< T >::m_regFAB, and BaseEBCellFAB< T >::nComp(). References Interval::begin(), CH_assert, CH_TIME, BaseEBCellFAB< T >::getRegion(), VolIndex::gridIndex(), EBISBox::isCovered(), BaseEBCellFAB< T >::isDefined(), EBISBox::isMultiValued(), BaseEBCellFAB< T >::m_ebisBox, BaseEBCellFAB< T >::m_irrFAB, BaseEBCellFAB< T >::m_regFAB, and Interval::size(). References Interval::begin(), CH_assert, CH_TIME, Box::contains(), MayDay::Error(), EBISBox::getDomain(), EBISBox::getRegion(), BaseEBCellFAB< T >::isDefined(), Box::isEmpty(), ProblemDomain::isPeriodic(), BaseEBCellFAB< T >::m_ebisBox, BaseEBCellFAB< T >::m_hasMultiCells, BaseEBCellFAB< T >::m_irrFAB, BaseEBCellFAB< T >::m_regFAB, and Interval::size(). Referenced by BaseEBCellFAB< T >::copy(). References CH_assert, CH_START, CH_STOP, CH_TIMER, CH_TIMERS, BaseEBCellFAB< T >::copy(), BaseEBCellFAB< T >::getRegion(), BaseEBCellFAB< T >::isDefined(), BaseEBCellFAB< T >::m_hasMultiCells, BaseEBCellFAB< T >::m_irrFAB, and BaseEBCellFAB< T >::m_regFAB. References CH_TIME, BaseEBCellFAB< T >::m_irrFAB, and BaseEBCellFAB< T >::m_regFAB. References CH_assert, CH_TIME, BaseEBCellFAB< T >::getRegion(), EBISBox::isAllCovered(), EBISBox::isAllRegular(), EBISBox::isCovered(), BaseEBCellFAB< T >::m_ebisBox, BaseEBCellFAB< T >::m_irrFAB, BaseEBCellFAB< T >::m_regFAB, and Vector< T >::size(). Referenced by BaseEBCellFAB< T >::assign(), BaseEBCellFAB< T >::copy(), BaseEBCellFAB< double >::dataPtr(), BaseEBCellFAB< T >::define(), BaseEBCellFAB< T >::fill(), BaseEBCellFAB< T >::getMultiCells(), EBCellFAB::getMultiValuedFAB(), BaseEBCellFAB< T >::getMultiValuedFAB(), BaseEBCellFAB< T >::linearIn(), BaseEBCellFAB< T >::linearOut(), BaseEBCellFAB< double >::offset(), BaseEBCellFAB< T >::operator()(), BaseEBCellFAB< T >::setCoveredCellVal(), BaseEBCellFAB< T >::setVal(), and BaseEBCellFAB< T >::size(). Referenced by BaseEBCellFAB< T >::assign(), BaseEBCellFAB< T >::clear(), BaseEBCellFAB< T >::copy(), BaseEBCellFAB< double >::dataPtr(), BaseEBCellFAB< T >::define(), BaseEBCellFAB< T >::fill(), BaseEBCellFAB< T >::getSingleValuedFAB(), BaseEBCellFAB< T >::linearIn(), BaseEBCellFAB< T >::linearOut(), BaseEBCellFAB< T >::nComp(), BaseEBCellFAB< double >::offset(), BaseEBCellFAB< T >::operator()(), BaseEBCellFAB< T >::setCoveredCellVal(), BaseEBCellFAB< T >::setVal(), and BaseEBCellFAB< T >::size(). Referenced by BaseEBCellFAB< T >::assign(), BaseEBCellFAB< T >::copy(), BaseEBCellFAB< double >::dataType(), BaseEBCellFAB< T >::define(), BaseEBCellFAB< T >::fill(), BaseEBCellFAB< T >::getEBISBox(), BaseEBCellFAB< double >::offset(), BaseEBCellFAB< T >::operator()(), and BaseEBCellFAB< T >::setCoveredCellVal(). Referenced by BaseEBCellFAB< T >::define(), and BaseEBCellFAB< T >::getRegion(). Referenced by BaseEBCellFAB< T >::copy(), BaseEBCellFAB< T >::define(), and BaseEBCellFAB< T >::operator()(). Referenced by BaseEBCellFAB< T >::BaseEBCellFAB(), BaseEBCellFAB< T >::clear(), BaseEBCellFAB< T >::define(), BaseEBCellFAB< T >::isDefined(), and BaseEBCellFAB< T >::setDefaultValues().